ConvertDocsNow Toolbar is a browser plugin which says that can help to convert PDF files to DOC files and vice versa. On top of that, it says that you will be able to convert other documents and images very quickly. It might really seem that ConvertDocsNow Toolbar is one of the most beneficial programs available on the web; however, you should know that we do not recommend trusting it completely. In fact, you should remove ConvertDocsNow Toolbar from the system the moment you detect it. In order to fully remove ConvertDocsNow Toolbar, you will have to get rid of the toolbar and then change your homepage and search provider because it is very likely that they will be replaced by the search engine that goes together with it. In order to find out how to do that, make sure that you get rid of this software as soon as possible. There is no doubt that you will be offered to change your homepage and search provider during the installation of ConvertDocsNow Toolbar. In fact, checkboxes will be checked by default and many users do not uncheck them. If you have not done that either, it is not surprising that you have noticed the presence of ask.com. This search engine might seem rather useful because it enables users to access Facebook, Amazon, Twitter, Wikipedia, Pinterest, eBay, and even Instagram, but it is still better to remove it and set the search engine and homepage you prefer. In fact, we do not recommend keeping ConvertDocsNow Toolbar either because all these buttons that are placed on it might redirect to suspicious websites. Even if you decide not to click on any of those buttons, it might still happen one day, which is why we suggest that you erase the toolbar. Do not forget that there are hundreds of other suspicious browser plugins published by Mindspark Interactive Network, Inc. Thus, you should definitely take care of your system’s security. You can try to protect the system yourself, but we think that the easiest way to do that is to install a security tool on the system. Specialists working at pcthreat.com also recommend that you stop downloading programs from various third-party websites because you might install a bunch of undesirable software alongside a free legitimate application. We do not think that you want this to happen, so we suggest being very attentive. If you do not want to see the presence of ConvertDocsNow Toolbar every time you open your Internet Explorer, Google Chrome, or Mozilla Firefox, you have to remove it completely. 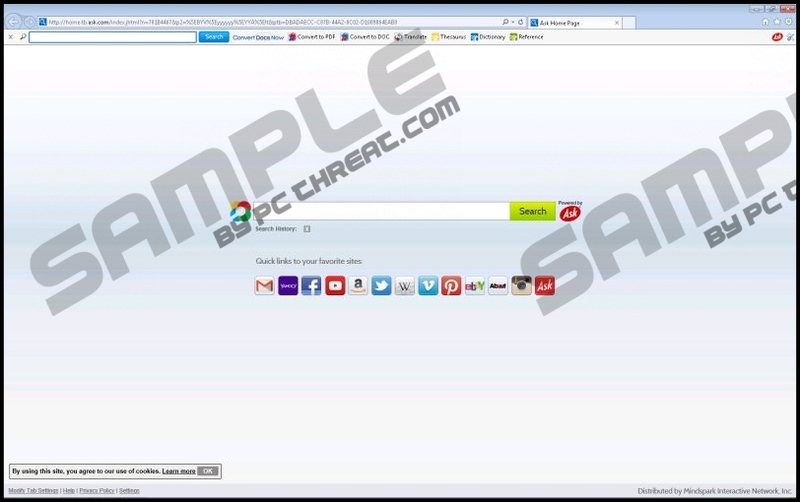 The easiest way to do that is to scan the system with an antimalware scanner; however, we do not say that you cannot delete this software yourself. If you decide to get rid of it yourself, you should know that you have to remove a toolbar via Control Panel if you use Internet Explorer and you have to remove extensions if you use Mozilla Firefox or Google Chrome. In case it seems too difficult for you, you should know that you can simply reset your browsers. If you do that, you will not need to perform the removal steps one by one. Click on this button once again when the dialog box appears. To confirm the reset, click the Reset button. Quick & tested solution for ConvertDocsNow Toolbar removal.